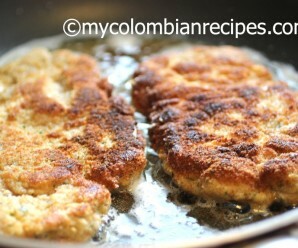 This delicious Albondigón is a traditional Colombian dish. I grew up watching my grandmother and my mom rolling this meatloaf at least once a week. 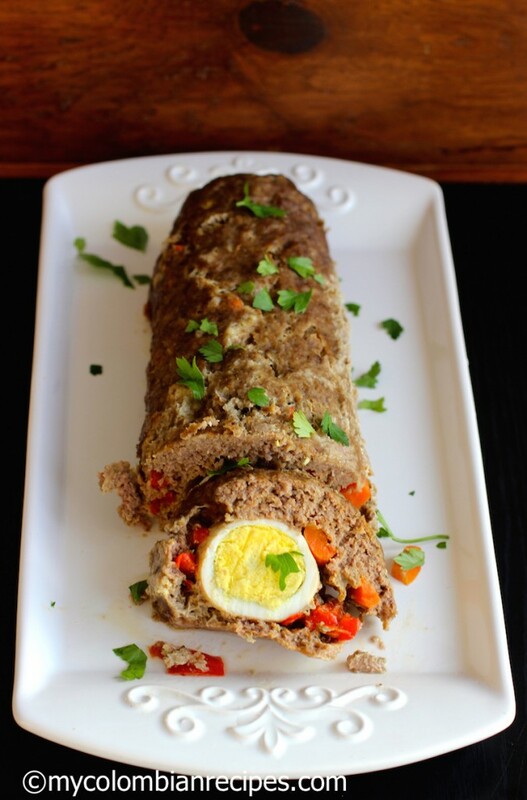 They use to roll the meatloaf in a large piece of fabric, tie the ends and cook it in a pot with water and vegetables. I just baked mine to make a little change. 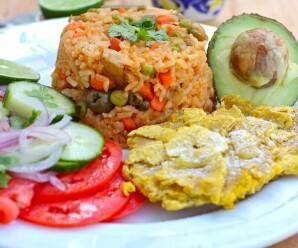 Albondigón can be served hot or cold, either as a snack or as a part of a main meal and it makes great picnic food. Adjust the oven rack to the middle position and heat the oven to 350° F.
In a large bowl mix the ground beef, ground pork, onions, scallions, garlic, bread crumbs, mustard, whisked eggs, parsley, salt, ground cumin and pepper, mix well until combined. Place a large piece of plastic on the kitchen counter and place the meat mixture on top. 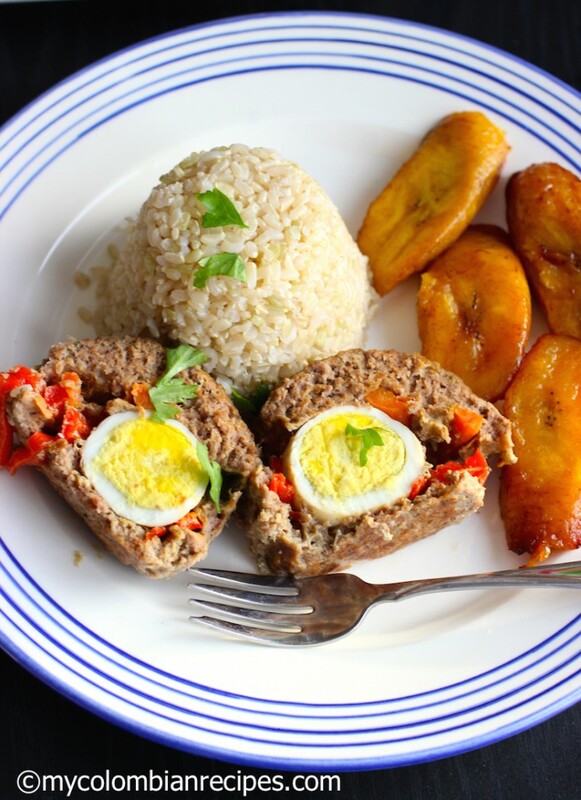 Flatten into a pattie and place the red pepper strips, the carrots and cooked eggs in the center of the pattie. Star rolling the meat mixture to enclose the eggs and vegetables completely. The plastic will help to tie the meatloaf. Spray a cooking sheet and take the plastic off the meatloaf. Place the meatloaf on the cooking sheet and cook in the oven for about 40 minutes. 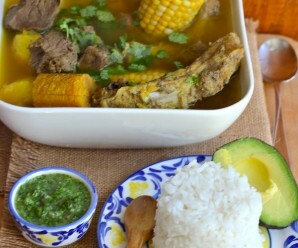 Tamaño albondigon and interesting that combine beef more pork! Love the stuffing in the meatloaf! This reminds me of my grandmother’s dish of a meatloaf with a omelet stuffing. Yummy! 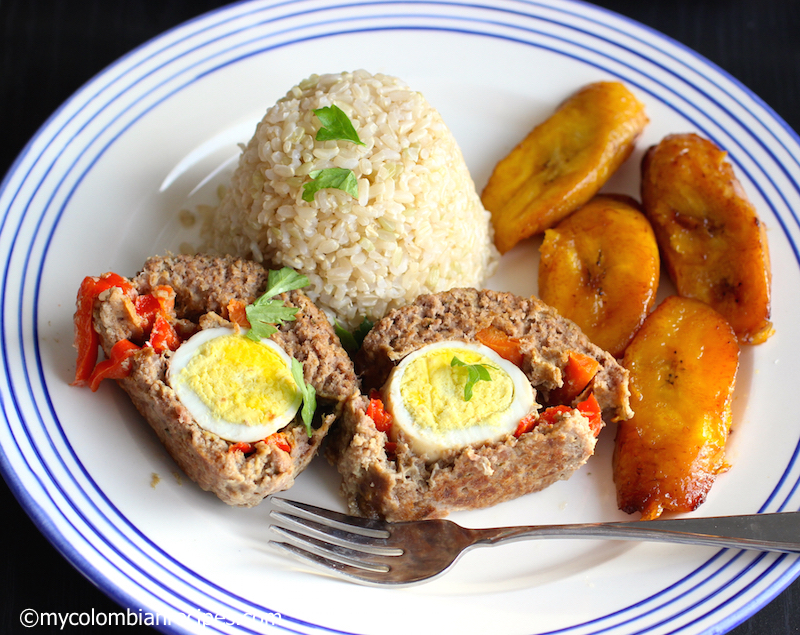 I love stuffed meats and think it’s a great presentation for guests — the center surprise! I can’t imagine boiling it like your grandmother did. I’m sure the cloth held it together but I don’t think I’ve ever tasted boiled ‘ground’ meat and while it sounds interesting, I’ve always preferred the oven method. This is so lovely, Erica! Rich, colourful & so delicious! 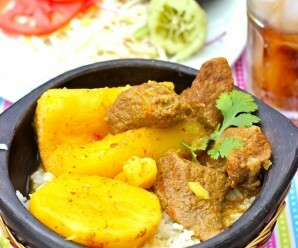 Hi Erica, this dish looks absolutely wonderful. 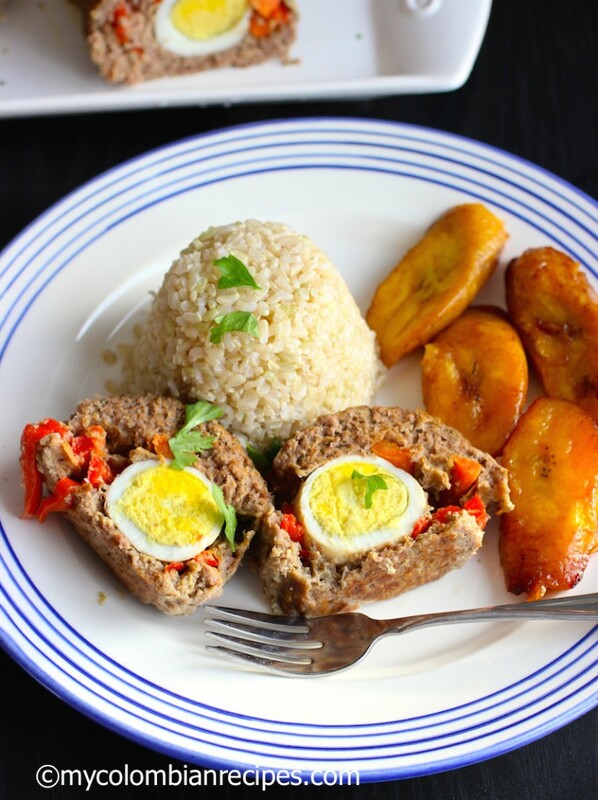 I just saw an article on grilling meat loaf and I wonder how this dish would work cooked like that. Grilling meatloaf sounds very interesting. That looks great! I am having a picnic in a couple of weeks and will try it. And the comment of grilled meatloaf sounds interesting too! Looks fabulous! 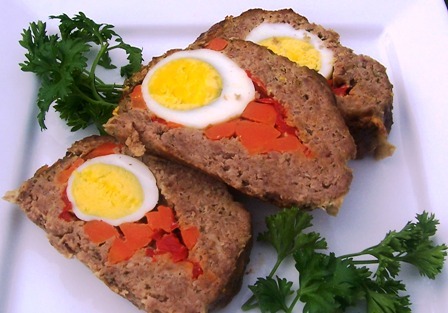 My grandma used to put eggs in her meatloaf. I made this for a family party! It was fantastic. I made it the day before and it was easy and delicious. This isn’t your mom’s meatloaf! Very flavorful and moist! 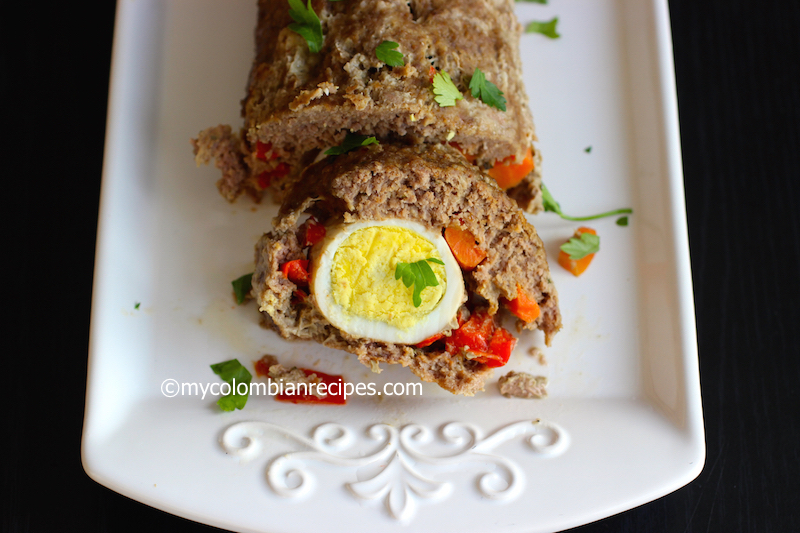 I made this meatloaf for a picnic with my friends and we all loved it. Thanks. This looks delicious. Question: Do you use ground mustard? Maria Elena- No, I used regular yellow mustard. I made this dish and it was really good. Hi Erica from Spain. Have you ever tried doing this in a slow-cooker (crockpot)? Possibly your Mum’s method might work better, i.e. using hot water. Thank you so much for all the wonderful recipes! My meatloaf is cooking in the oven as we speak I can’t wait to try it! It was an absolute pleasure to make … thanks so much! !